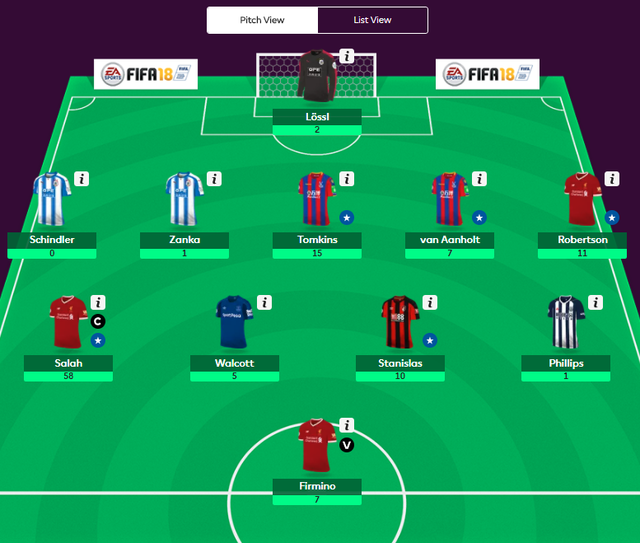 Despite just four fixtures and eight teams in action, gameweek 31 saw a rather high average points score of 46 considering the circumstances. Greg S. tops the Cherries fan league after a great week, finishing on 102 points and seeing his total rise to 1,966. At the back, both Virgil Van Dijk and Patrick Van Aanhold kept clean sheets, with their total amassing to 13 between them. Further forward, Luke Milivojevic got his goal, whilst Theo Walcott also bagged an assist. However, the key to Greg’s success was the choice of Mo Salah as captain, meaning that 58 points were duly added to make 102. Hot on his heels is regular high-flyer Ivan Kasagga, who sits on 1,954 and enjoyed a score of 91 this week. Again, Van Dijk was a popular choice at the back, whilst Cherries midfielder Junior Stanislas came up trumps with ten points after scoring the winner. But, once again, Salah as captain was pivotal, with Roberto Firmino also adding seven points after his goal against Watford. Nevertheless, it was Hema Saad from Egypt who was the Cherries fan that scored the most gameweek points with 144. A bench boost well played, as well as Salah as captain, were the keys to his successful week, whilst all but one player scored points. Crystal Palace duo James Tomkins and Van Aanholt gained 22 points between them after a clean sheet and goal for the former, whilst Andy Robertson bagged 11 following his assist. Elsewhere Stanislas proved pivotal with ten points and Cenk Tosun bagged a brace to give him 13, leaving Hema with a rather pleasing total.